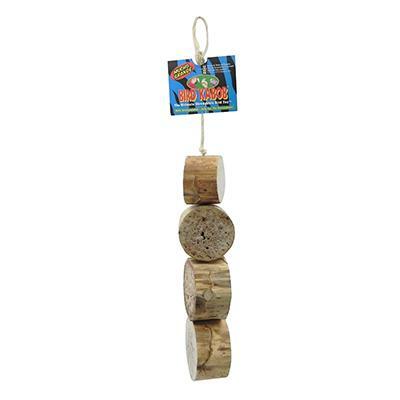 The Bird Kabob Mucho Grande is sure to be one of your bird's favorite toys in no time. Thick sections of dried yucca strung along a sisal rope make the ultimate shreddable bird toy. The yucca is soft enough that your bird will want to sink its beak right in and start chewing away at it. Similar to the Bird Kabob Original #14425, but the yucca sections are much larger and includes the harder exterior portion of the plant. Each Bird Kabob Mucho Grande has 4 sections of yucca, each one approximately 2-inches thick and 2¾ - 3½ inches across. Total length of yucca rounds (not including string) is approximately 12 inches but size may vary as these are natural components.